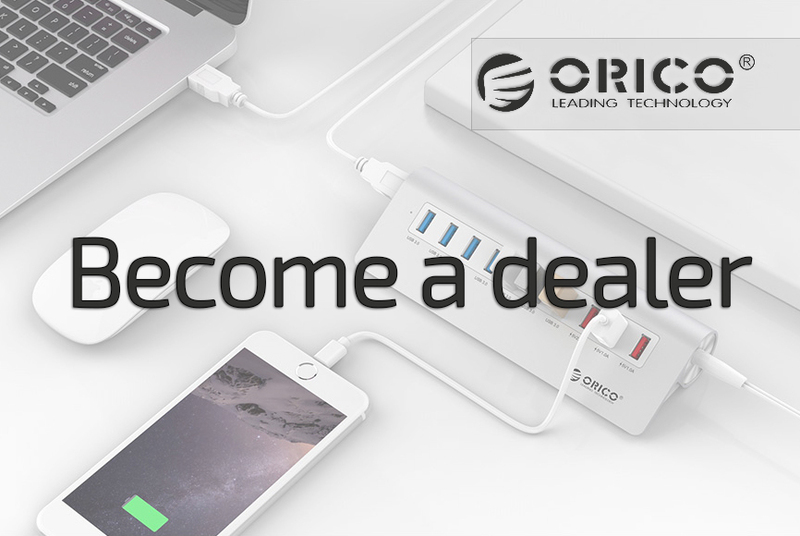 Orico USB hubs can be used plug & play. Sometimes, however, it happens that a customer contacts us because a USB product does not work. The causes we encounter are often hidden in interference with the USB connections at the transmitter or the receiver (one side computer / other side connected device). From our position, however, we can not determine which devices are connected and what their status is, but experience shows that we often have satisfied customers after completing a number of steps. -Is the most recent version of the driver installed? If you still encounter problems afterwards, please contact us by e-mail stating your order / order number. Do you have problems with charging your iPhone / smartphone or iPad / tablet via the USB? This is because your device requires more (charging) power than a USB 3.0 port can give. More information and solutions can be found on the special page about charging via USB. A USB hub is an extension of your current USB port. However, the hub is still connected via a single USB connection. The maximum limit of the hub is therefore limited by the maximum capacity of the USB port to which it is connected. With USB 3.0 this is a maximum of 5Gbps and 0.9A. Do you want to perform more than 5 Gbps data transfer? Then you will notice that the speed is not reached and the USB hub can become overloaded. In addition to the above, where we explain that a USB 3.0 port can deliver up to 0.9A, Orico has several USB hubs with extra power adapter in the range. This guarantees a stronger and more stable power supply for the hub. The heaviest versions are equipped with no less than 5A power adapters so that multiple devices can be connected. The limit remains 5 Gbps and 0.9A per port. There are two exceptions to this, namely the BC1.2 charging and data ports (max 5 Gbps and 1.5A per port) and the Smart Charge ports (no data, no more than 2.4A per port). Based on this information, you can check how many devices you can connect to the USB hub to prevent overload. There are Mac users who experience problems with the use of non-original Mac peripherals. Unfortunately, this is a typical Apple theme, which can affect not only the operation of, for example, Orico's USB hubs, but the use of peripherals from other brands in general. On the internet you may have come across stories that Orico would not work with Mac. In practice, in 97% of the cases, Orico's USB hubs and docking stations work without problems with Mac. In the other cases we advise you to update iOS, so that you have the latest operating software. In practice, this has helped most people. Where Mac refuses access to peripherals, other than Apple itself, it can happen that products are not recognized. However, this applies to all products of a different brand than Apple. PCIe cards may require a little more attention for these to be operational, especially when the PCIe ports have not been used before. If you have mounted the PCIe card in your PC, you should check whether it is recognized via "Device management> USB devices". You can then perform the installation here. If the PCIe card is recognized, but the connected devices are not, check that the power supply is correctly connected. This cable is in your computer. If this cable is too short, it is possible to use an extension cable.